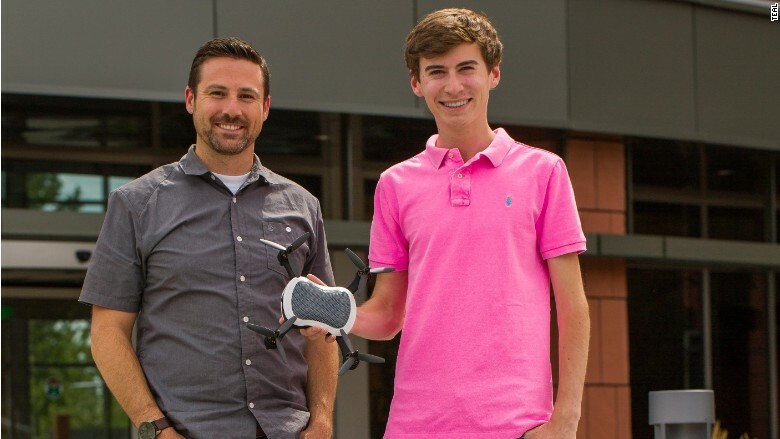 George Matus Jr. may be 18 years old but don't call him a novice when it comes to all things drone. By age 12, Matus had already built his first flying quadcopter and was serving as a test pilot for a drone company. Five years later, he was selected among 2,800 applicants to be a Thiel Fellow from the Peter Thiel's Foundation. The organization pays young entrepreneurs $100,000 over the course of two years in exchange for skipping college or dropping out to work on their own ventures. 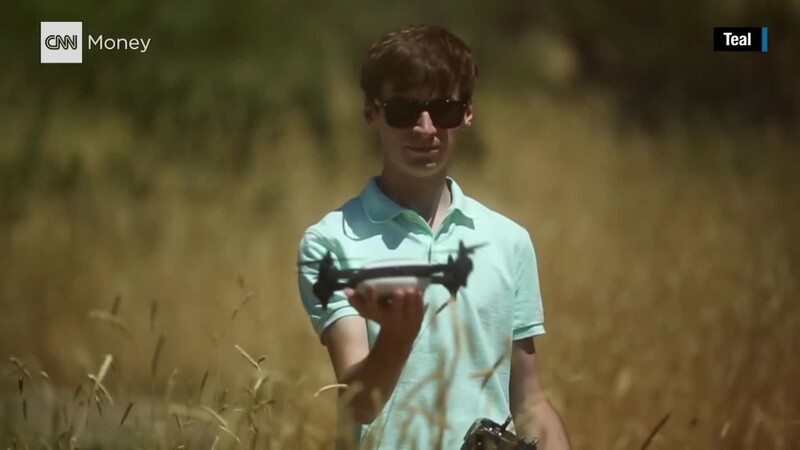 Now, Matus is launching his own consumer drone brand, Teal. His drones, which are available for pre-order starting Wednesday for $1,299, will be capable of flying as fast as 70 mph and sustaining winds of up to 40 mph, Matus told CNNMoney. That makes them faster than current out-of-the-box drones on the market. For comparison, popular consumer drone manufacturer DJI's drones currently fly between 45 and 49 mph. Parrot's fastest drone, the Bebop 2, goes a maximum 40 mph. And 3D Robotic's fastest drone tops 55 mph. But speed isn't Teal's biggest selling point. It will come with a built-in mini computer that can handle machine learning, image recognition and more drone capabilities -- it's essentially a flyable smart computer. George Matus, Jr. (right) with Teal COO Billy McGuire. Until now, consumer drones typically serve a specific purpose -- like racing, aerial photography or hobby flying. Teal can do all those things but also has the capacity for more. "We wanted to go for universal," said Matus, who lives in Salt Lake City with his parents. Matus, who has raised a $2.8 million seed round of funding, plans to launch an open software development kit so developers can create apps for the drone. The apps could include anything from augmented reality to advanced autonomous flying to search and rescue. The drone is weatherproof, durable and portable -- Matus slipped it in and out of his backpack when showing it to CNNMoney earlier this month. It's also built to withstand repairs; the drone's battery and arms can be removed and replaced if they break. Similar to other drones, the battery has a pretty short life -- it'll last just 10 minutes. But Teal comes with two batteries, so you can pop in the second after the first one dies. While the startup was previously referred to as iDrone, Matus renamed it prior to launch. "It's something that doesn't immediately associate us with Apple," noted Matus, who works on Teal full-time -- along with two others -- now that he's graduated high school. The team also works with 12 contractors. The drones, which are assembled in Utah and made and molded in Texas, are expected to ship before the end of the year.